The result of the counted votes and the increasing abstention (27.1% of the electorate, equivalent to about 12.5 million citizens) in the elections of March 4 reveal a wide popular, anti-system and anti-EU protest. Tens of millions of workers, unemployed, working women, have denied their support to the traditional and corrupt parties that have governed in recent decades. Many of these people, without class consciousness and disappointed by the bourgeois left, have been ensnared by the populist and xenophobic parties, believing that they will change with them and safeguard their interests. Only the development of the class struggle and the work of the Communists will succeed in changing that position. A multipolarism on territorial bases has emerged from the polls, which reflects the inequality and disintegration of bourgeois Italy, amplified by the neo-liberal steamroller, the long stalemate and the policy of austerity. No political force has an absolute majority in Parliament. The difficulty in forming a government led by the standard-bearers of the financial oligarchy, supported by a cohesive bloc, demonstrates the crisis of hegemony of the Italian bourgeoisie and the process of differentiation and political radicalization of the petty bourgeoisie. The right coalition won 37% of the vote, but that is not enough to govern. 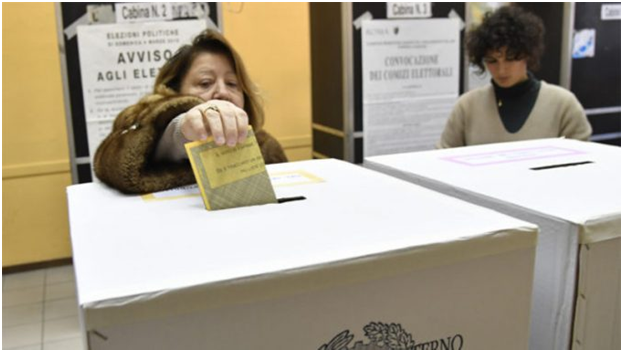 In that coalition the balance has been broken, with the advance of the League, which has obtained about 5.5 million votes (about 4 million more than in previous elections), reaching 17.5%, and with the fall of Berlusconi’s party, which reaches its historical minimum. The right is increasingly characterized by its racist, xenophobic and chauvinist positions. The most aggressive sectors of monopoly capital will try to support this coalition, grouping together other forces, to solve the problem of the government and expand the offensive against the labor and union movements. The Five Star Movement (M5S) list has triumphed by obtaining more than 10 million votes for the House (32.2% of valid votes). It is therefore the main political party. It has received massive backing in the south of the country and has collected a large part of the votes lost by the Democratic Party. The M5S is now the new epicenter of parliamentary games, but it has no allies and cannot govern alone. This movement, of a populist and “inter-classist type,” picks up political discontent. It appears as a force of rupture with the system, but is totally incapable of carrying out an organized struggle against the bourgeois regime, and therefore will not be able to solve any of the fundamental economic, social and political problems. The Democratic Party (PD) has suffered a political defeat in collecting only 18.7% of valid votes (it has lost about 2.8 million votes compared to the previous elections). Its regional bases are disjointed and reduced to the minimum expression. In recent years, this party has played the role of being the main political leader of financial capital. With Renzi, it has imposed anti-worker and anti-popular laws such as the reform of the labor code and the counter-reform of education; has tried to modify the bourgeois-democratic constitution; and has supported the imperialist war policy. Before the referendum, and then with the vote of March 4, workers and youth have punished this liberal-reformist party and cast aside its arrogant boss. The big bourgeoisie has a serious problem, because it does not have another big game to lean on. Some sectors propose an alliance of the PD with the M5S, to reach the number of necessary votes. Renzi’s late resignation may impede this option and favor the right. The social democrats, the opportunists and the revisionists, affected by the collapse of the PD, have failed in all their electoral projects. As for “Free and Equal”, its political mediocrity has not had any ability to attract workers and young people. The attempt to re-launch the social democratic political and trade union bureaucracy has failed, but the few deputies obtained can be used by an “emergency” government. The percentage point obtained by the eclectic radical coalition “Power for the People” is the umpteenth demonstration that one cannot build a popular left alternative on electoral and parliamentary illusions, without the leadership of the working class, and with lists full of recycled candidates. The very poor result obtained by Rizzo’s party shows that symbols and propaganda without political, revolutionary content are not enough to get out of the transitory defeat of socialism, and overcome the slump. With the electoral result, a new chapter of the Italian political and institutional crisis is opened. The collapse of Renzi and the weakening of Berlusconi have wrecked the neo-centrist project, which pointed to a government of “grand coalition” supported by the Troika. The Italian crisis is so profound, so much has the cohesion between the possessing classes broken, that a “bourgeois government” with a homogeneous program, able to consolidate the dominant bloc and hegemonize the middle classes is now impossible. In the coming weeks the contradictions of the bourgeois and petty-bourgeois parties will come to light. We will see maneuvers, back-stabbings, transformisms, interference of the “financial markets” and foreign powers (EU, US, Vatican) in Italian political life. They will seek by all means to favor the formation of an anti-popular and pro-European government that will continue the dismantling of the conquests and the rights of the workers, the institutional counter-reforms, and the war policy. A period in which the capitalist attack will be even harder awaits us and class conflicts will assume a more open and harsh character. In this situation it is a crime to be left paralyzed by the reformists, who will do anything to stop and divide the struggles, curb the initiative of the masses by the union bureaucracy. The unity of the struggle of all the forces of the proletariat and, on its base, the widest popular unity against the capitalist offensive, the political reaction and the threats of war, with neo-liberalism and with the system that produces it — so that the capitalists and the parasites pay for it — is definitely urgent. The essential condition for breaking the power of monopolies and the rich is the formation of a broad coalition of all sectors of the working class. A force determined to put an end to capitalism, and the mobilization and formation of mass organizations (Councils, Committees, Assemblies, etc. ), in opposition to the bourgeois parliament, to bring to the streets the only possible and necessary alternative: a government of the exploited and the workers. To advance this revolutionary perspective, the communists and the vanguard elements of the proletariat have to separate clearly and definitively from opportunists of all kinds and join in an independent and revolutionary political party of the proletariat, opposed to all the political parties and formations of the exploiting classes. A party that has its ideology – Marxism-Leninism – its program, a policy completely independent of the bourgeoisie and the petty bourgeoisie, a party prepared to become the leader of all the exploited and oppressed masses through the revolution. A party that is very clear about the goal of the conquest of political power, the establishment of the dictatorship of the proletariat and the construction of socialism and communism, and that carries these objectives in their daily political action. It is time to take resolute steps in this direction, and take advantage of the political instability and lack of government to develop the communist organization and political initiative. We are not unprepared, the crisis of the bourgeoisie proceeds and events accelerate. The battle will unfold and will be won outside the parliamentary forums, in the rough seas of the class struggle.